But, what about the little ones? Are they donning their finest red, white, and blues and sufficiently freaked out about being blown to bits by Muslim terrorists who hate freedom but love fiery jihadist death? No? Well then, have we got just the thing for you! 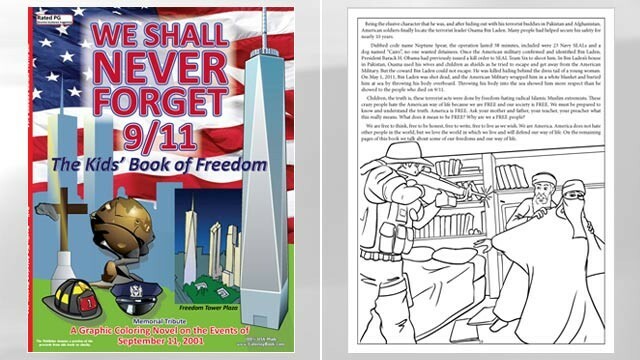 A delightful wingnut coloring book, “We Shall Never Forget 9/11: The Kids’ Book of Freedom” to remind the li’l whippersnappers who’s with us (Christians! ), who’s against us (liberals!) and who wants to murder us all in a massive explosion of jet fuel and steel (Muslims!). Now, the kiddies will never forget 9/11. And much like drunk Uncle Ray, they’ll never forget what color terrifying Muslims destroying America and freedom should be shaded in either. Remember, children, the awful brown crayon is for Osama-y people and the beautiful peach color is for the American soldiers! What they will forget however is that Bush and Cheney repeatedly ignored warnings about Osama bin Laden, and then used the 9/11 attacks as an excuse to dupe the dumb, unsuspecting public into a bloody, protracted war in Iraq for oil and corporate profits, because Crayola still hasn’t figured out the best crayon to use when shading in evil. How about Saudis? Or psychos, maybe? Though, as soon as li’l Johnny is done coloring, you can probably call them brown people, too. Or ragheads. Whatever you prefer! Seriously, who doesn’t love children’s coloring book history lessons, like why this time, it was the awful, no-good, freedom-hating Muslims, not the gross gays or greedy Jews, responsible for all the 9/11 death and destruction? Oh well, time to go help my toddler color the picture of the bomb in tower 7. Also, the Christian cross at ground zero could use some filling in. But, be sparing with your blue crayons, kids! You’ll need those for the waterboarding pages. See, isn’t America grand? Instead of just being afraid of Muslims, you can be scared of coloring books too!